I think that's a technical term from Harvard's Kennedy School of Government. 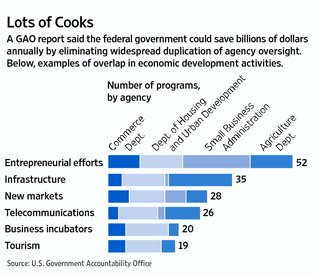 These are a few of the findings in a massive study of overlapping and duplicative programs that cost taxpayers billions of dollars each year, according to the Government Accountability Office. And the Democrats are acting like it's the end of the world to cut $60 billion off a $1.5 trillion deficit. curb redundancy, nah. Just create an umbrella agency for all...like Home Land Security, and really turn this plate of spaghetti into a Kafka novel. I like that. Very appropriate - crisscrossing jurisdictions, responsibilities. Very nice. I wonder if many of these bureaucratic agencies tend to have similar "Mission Statements" framed and hanging in their lobbies.